Veteran British songwriter and guitar sage Michael Chapman ranks among the innovative midcentury English guitarists-Davey Graham, Richard Thompson, and Michael's old friend Mike Cooper are others-who transposed the atmosphere and syntax of the blues to a British context through reinvention and deconstruction rather than imitation. But Chapman uniquely deploys his liquid virtuosity and his resonant, slurred Yorkshire burr as vehicles for his mournful (and often barbed) musings on the pleasures and perils of hard living. His music feels suffused with the crooked logic, unfulfilled longing, and existential danger of dreams, shaded with his own wry sensibility of Northern darkness. Like a peaty whiskey (or Bob Dylan), the smoky gravitas of his playing and singing has grown more trenchant and entrenched with age; no one else sounds like him. 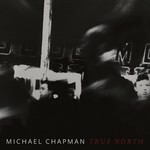 The masterful follow-up to his universally celebrated 2017 album 50, Michael Chapman's True North finds the elder statesman of British songwriting and guitar, at seventy-eight years old, plumbing an even deeper deep and honing an ever keener edge to his iconic writing. This authoritative set of predominantly new, and utterly devastating, songs hews to a more intimate sonic signature-more atmospheric, textural, and minimalist than 50, stately and melancholy in equal measure. Recorded in rural West Wales, True North unflinchingly surveys home and horizon, traveling from the Bahamas to Texas to the Leeds of Chapman's childhood, haunted by the mirages of memory and intimations of mortality. Joining him on this introspective journey is a cast of old friends and new disciples: once again Steve Gunn produces and plays guitar, and Bridget St John sings, collaborating with cellist Sarah Smout and legendary pedal steel player BJ Cole, who has accompanied everyone from John Cale to Scott Walker, Elton John to Terry Allen, Felt to Björk to Brian Eno.